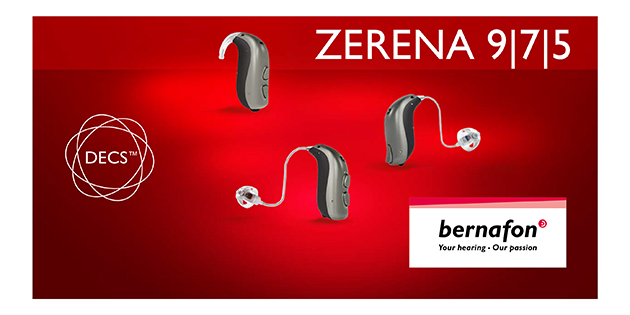 Hearing Aid Source is proud to feature the new Bernafon Zerena hearing aids. These new hearing aids come in three technology levels and three styles. The technology levels are labeled as the 9 7 and 5. The 9 being the top-of-the-line respectively. The styles available come in the miniRITE, miniRITE-T (T =telecoil) and the BTE 105. Since the launch of the Bernafon Zerena hearing aids, we were curious and some people have asked us, if the Zerena hearing aids, are any different than their cousins – the Oticon Opn product. This required some in-depth evaluation and further question asking. The Bernafon Zerena platform borrows chip technology from its cousin the Oticon Opn, however Bernafon uses the chip differently, utilizing Bernafon’s Channel-Free sound processing and their new Dynamic Environment Control System (DECS) philosophy throughout the Zerena device lineup. DECS, simply put, is an ever-evolving, rapid-reaction system which uses constant cues from the environment in which it is working to calibrate the noise reduction, directional microphones and speech enhancement settings to provide the most optimal sound to the listener. Bernafon has been known to be the ‘value’ brand, and so there is a slightly lesser price in all comparable technology levels. That being said, they do not skimp on audiological features such as Frequency Composition, noise reduction, directional microphones. Bernafon has also made the Zerena hearing aids more durable with IP68 ratings which provide superior moisture and dust resistance. Our in-house and personal-use tests revealed that the Bernafon Zerena hearing aids do sound and perform differently than their Oticon Opn counterparts when in situations of noise. This somewhat negatively affected our ability to hear speech in noise somewhat compared to its cousin as well as other comparable models, however it was significantly better than currently available, older generation hearing aid models. In many ways, the Zerena platform is an advanced device set and should be considered for many people looking for a value-added, iPhone direct connect, advanced hearing device.